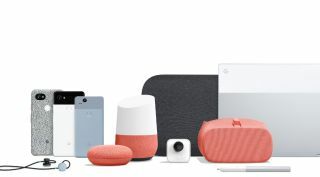 Google puts AI first new Pixel 2 smartphones and Pixelbook laptop, as well as new versions of Google Home smart speaker. Google has unveiled its latest generation of mobile and smart home hardware, powered by the company’s most impressive AI software yet. The online giant revealed its new Pixel 2 and Pixel 2 XL smartphones at an event earlier today, alongside two new versions of its Google Home assistant and an all-new Pixelbook laptop. But along with the expected hardware upgrades, Google’s new kit also packs its most developed artificial intelligence software to date, marking a major step up and what the company says should be a significant selling point for the new devices. Noting that many smartphones available today offer similar specifications, Google’s Rick Osterloh highlighted that the impetus was now on manufacturers to offer improved user experiences. Google CEO Sundar Pichai noted that the company’s future success would be down to combining AI, software and hardware, rather than just focusing on one area. "We are at the forefront of driving shifts in AI,” he said. First up, the new Google Pixel 2 and Pixel 2 XL feature a significantly smarter Google Assistant, which can now be launched by squeezing the side of the phone. Both devices will also run Android 8.0 Oreo out of the box, and feature upgraded cameras, including a new Google Lens service which can intelligently identify objects in your photos by comparing them to millions of images across Google’s online database. The new devices, described as “the most helpful phones around”, mark a major step up from previous generations, offering larger, brighter screens (5in for the Pixel 2 and 6in for the Pixel 2 XL), an all-day battery life, and a new always-on display to show your key notifications. They will cost from £629 for the Pixel 2, and from £99 for the Pixel 2 XL, with pre-orders opening now and going on public sale on November 19th. Next, the company’s new Pixelbook laptop is the first such device to come with the Google Assistant built in, offering a smarter way to work and browse the web. As well as running Chrome OS, the Pixelbook will also support Google Play apps, meaning users can easily transfer their favourite mobile services, as well as work seamlessly across devices using Google Drive, Evernote, and other such tools. Inside, there’s a choice of Intel Core i5 or i7 processor, up to 16GB RAM, and up to 512GB storage, as well as a 10-hour battery life, and automatic security and app updates and patches. The Pixelbook will cost from £999, with pre-orders also opening today, and general sale starting October 31st. Lastly, Google also announced an expansion of its Home product line, with two new additions - Google Home Mini and Google Home Max. The former is a slimmed-down version of the original product, which will cost just $49, with the latter focusing more on audio capabilities in a bid to take on the likes of Amazon Echo.